According to the Buddhist Handbook, mantras are “highly compressed, power-packed formulas, usually of Sanskrit origin, which are charged with deep meaning and magical potency.” This can seem daunting, but putting your new mala to use is simple and enjoyable. Start by clarifying the intention of your practice and choose your mantra or affirmation. Then, find a comfortable space and sit quietly in a cross legged position. Close your eyes and focus on your natural breath. Begin to bring your attention onto your mantra or affirmation. 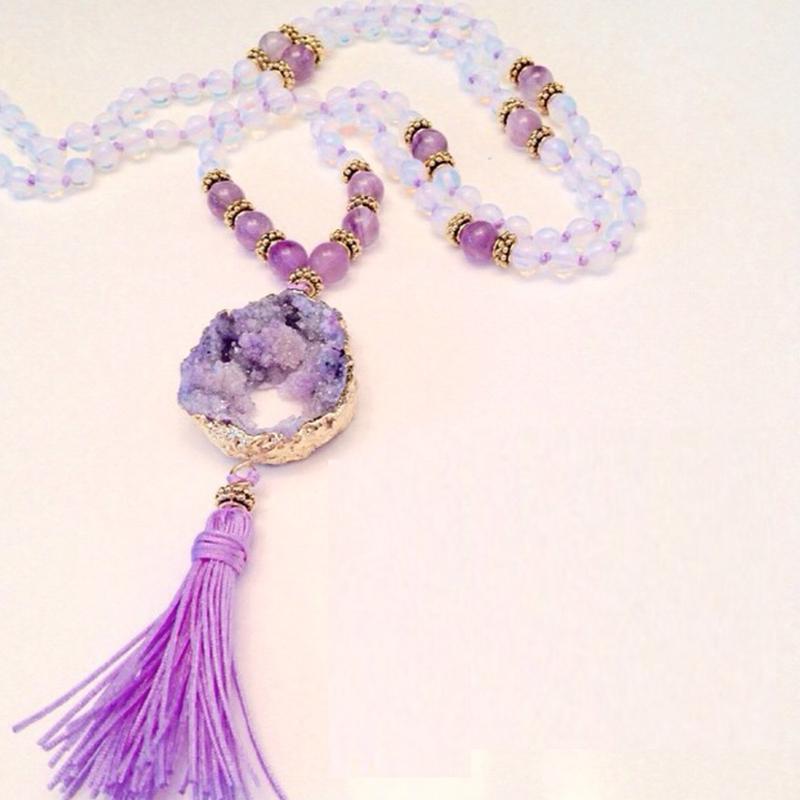 Next, hang the first mala bead gently on the middle or ring finger of your right hand. Place your thumb on the guru bead and begin reciting your mantra. At the end of the mantra push the mala bead away with your thumb and move onto the next bead for another round. Continue until you reach a count on 108. If you wish to do another round of mantras or affirmations, do not skip over the guru bead. Instead, turn the mala around and move in the opposite direction. ​In this instance Shiva is the supreme reality, the inner self. It is the consciousness that lives in all of us. Shiva is the name of the true self. Simple translation: “I honor the divinity within myself” or “I honor that which I am capable of becoming.” Literal translation: “Adoration to Shiva.” Get ready to radiate self – love and positivity! So Ham is known as a “natural mantra” because it is already part of our nature – our breath. Soooooo is the sound of inhalation. Haaaaaaam is the sound of exhalation. The So Ham mantra has been called the universal mantra because of the fact that its vibration is already a part of the breath, and everybody breathes. Soooooo… on the inhale and haaaaaam… on the exhale. The English translation is not as important as the quality of the sound vibration, but it translates as “I am that”. When repeated, it declares I am that I am that I am. This mantra calls upon the powerful energy of Ganesh. Om Gam Ganapataye Namaha can be loosely translated as “Hey! Wake up my root chakra so I can move through obstacles in my life! Thanks!” As we have learned from Kundalini yoga, Ganesh or Ganapataye, resides in our root chakra – our foundation. When we wake up this chakra we connect with our true selves with ease and obstacles standing in our way disappear. Let go of whatever is standing in the way of your dreams – focus on the journey rather than the challenges. The Hare Krishna mantra is composed of Sanskrit names in the singular vocative case: Hare, Krishna, and Rama. “Hare” can be interpreted as “he who removes illusion” or “the energy of God” while Krishna and Rama refer to God himself, meaning “He who is All-Attractive” and “He who is the Source of All Pleasure”. It has been said that by repeating this mantra with faith and devotion, one can attain salvation and peace of mind. 3. Choose words that have personal meaning to you. The more they evoke emotion, the better. 4. Repeat it often, even if you don’t see any changes taking place. Have patience! Most importantly, whatever mantra you choose, believe in it and in yourself. Use your mala and your mantra daily, have faith in it, and you will see huge changes in your life.